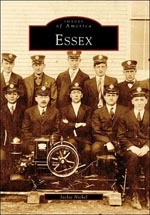 Brewers can trace history back to Essex, Middle River area. “…The Bauernschmidt families were very famous brewers of beer here in Baltimore. A tradition they brought with them from their Bavarian roots. George Bauernschmidt built a brewing empire in Baltimore starting in 1864 with the founding of his George Bauernschmidt Beer brand. Bauernschmidt Manor, a set on Flickr. “…Fred and Agnes began building what we now call the Manor House sometime around 1905. It is rumored that bricks used for the foundation of the house came from buildings that were destroyed in the great Baltimore fire of 1904. They lived in the home during summer months and hosted many parties and fundraisers there for their favorite charities. Many of Baltimore’s wealthiest residents attended these functions. Read “‘B’ is for Beer in Baltimore” at Essex Patch. Our association’s 2013 Year In Review is now available for your reading pleasure! The report provides an in-depth look at our organization for the year 2013. Please CLICK HERE to access the Year in Review.